1. What are QR Codes? QR is the abbreviation for Quick Response. 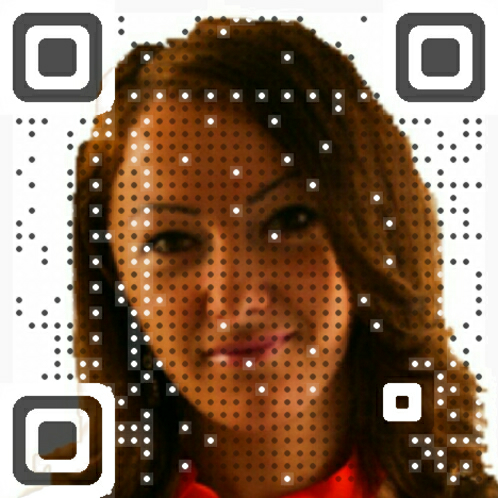 QR codes are two-dimensional barcodes. According to Wikipedia, the QR code system was invented in 1994. QR codes became very popular due to their fast readability. A QR code consists of square dots arranged in a square grid which can be read by different devices such as smart phones, tablets, QR readers. Users can read QR codes by using different sites or apps or generate QR codes. Using QR codes in the classroom can be so much fun! By using QR codes, teachers can substitute, augment, modify, or redefine learning experiences (SAMR). QR codes can really make things much easier. QR codes have increased productivity so much in my class! Since we started using them, everything was a click away. Just imagine having your students access a thesaurus, or just having to type this word in their browser. Right after I introduced the QR codes to my students in our English Language Arts class they had to find synonyms for certain words. Having a QR code for the thesaurus, was so helpful for all my students because accessing it was just practically just a click away. I also saw the huge benefits of using QR codes when I had my parent-teacher conferences a couple weeks ago. Again, sharing with parents their children’s websites, e-portfolios, blogs, or class resources, was just a click away. Besides that, all the resources parents scanned during our parent-teacher conference were automatically saved in their app history which made it so easy to collect and reference later. QR generators (first one is my favorite, but I like other sites for the different features they provide, too). 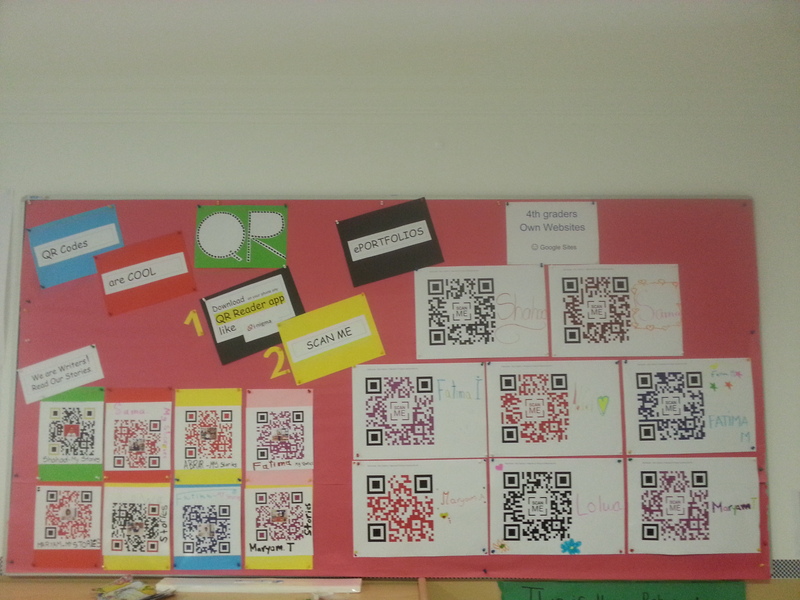 What can you do with QR codes in the classroom? Students can scan QR codes to take them to a specific website for research, blog, or other online resources, listen to a story that is being read aloud, watch a video on an academic topic, complete academic scavenger hunts, etc. -4th grade students recording themselves reading books for a Kindergarten class (they just pasted the QR code inside of the book cover). We used the MP3 app to record these audios. You can also use the mp3.org website or any other websites to produce audio files. -students made Google Presentations (it can be any topic: math, science, social studies, English Language Arts, etc.) and pasted their QR codes to a 3-D art project or diorama. – Back to School Scavenger Hunt for parents by writing clues, attaching them to QR codes and pasting the QR codes around the room. Check out a cool free Back-to-School QR Code Activity created by The Techie Teacher on Teachers Pay Teachers here. This activity is so much fun! Also, you can check out another great Back to School Scavenger Hunt QR Code Activity created by Loretta Lee on Teachers Pay Teachers here. 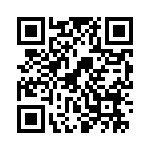 Download a QR reader app (like i-nigma) and scan my teacher blog QR code. You’ll see how all QR codes you scan are saved in your history. 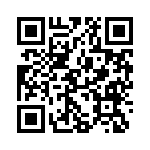 I created this QR code with Visualead. 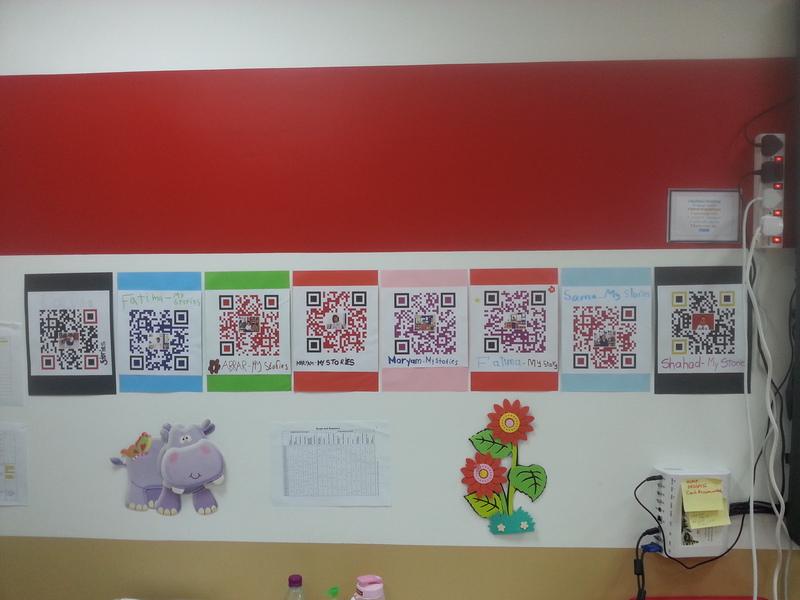 I displayed QR codes all over my room. 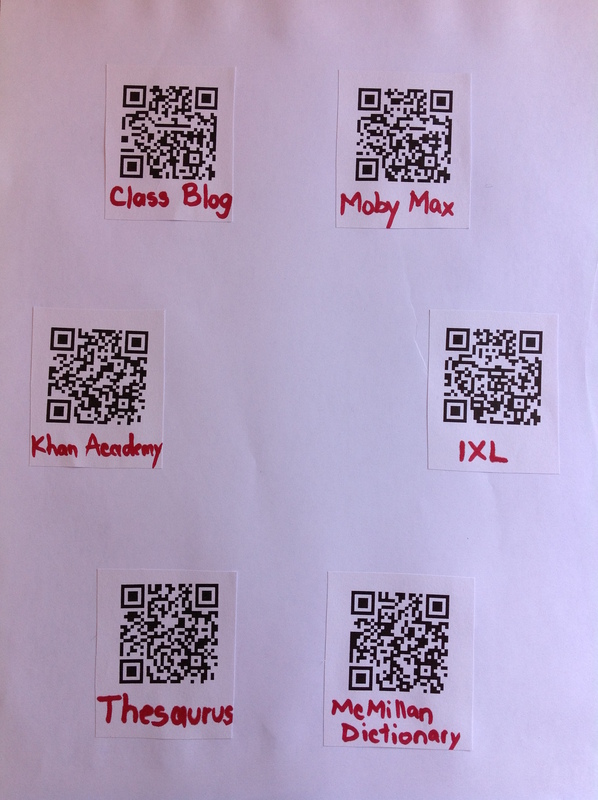 These QR codes are links to various online resources we are using in class, or links to students’ portfolios, their own websites, or audio books reviews. I created these QR codes with QR code generator and I had the unpleasant surprise to notice that after the 14 day trial period I wasn’t able to use the codes I created during the trial period. So, I had to re-create all of my QR codes, because upgrading was too expensive, and like all teachers, I prefer using free websites when there are plenty other free options. I am including them here for you to see even though if you tried to scan them, it would say that they were archived. I didn’t want to display here the new ones I created just because I am keeping my students’ eportfolios private this year. I am very excited about the potential of QR codes in the classroom. I am also very excited about the audio QR codes–more information about audio QR codes in my next post. Audio QR codes are so awesome! This entry was posted in 21st century skills, Communication tools, Educational Technology, iPad, Second Language Learners, Web 2.0 tools and tagged educational technologies, ePortfolios, i-nigma, instructional technologies, QR, QR codes, scan me. Bookmark the permalink.